"The biggest problem is to make sure that there are no human-created ERB (Einstein-Rosen Bridge) machines ("Star Gate" time machines). It sounds science fiction, I know, and it's hokey-sounding, OK? But we need to make sure there are none of those in existence which can automatically turn on when the next age begins on December 21, 2012. We are apparently going to cross over the plane of the galaxy in which there is a dense network of wormholes. There is supposed to be some sort of enlightenment. Whether or not that's the Christ event or whether that's a burp on a Sunday morning, I don't know what that's going to be." Dan B Burisch, Ph. 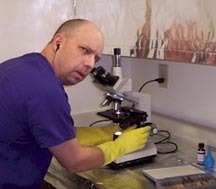 D., Microbiologist, working in Las Vegas, Nevada in 2004. Photograph by BJ. May 23, 2004 Las Vegas, Nevada - On June 7, 2003, Bill Hamilton - then Executive Director of Skywatch International - was given permission by microbiologist Dan Burisch, Ph.D., to interview Dr. Burisch on-the-record as a whistleblower in a videotaped session attended by five other researchers with their own videotape cameras. The subjects were Dan Burisch's 1994 work with the J-Rod entity at the S-4/5 underground laboratory, Area 51, Nellis AFB, Nevada; the Doctrine for Converging Time Line Paradox (DCTP); and Dan's concern about the future of this planet.Here is Part 3 of that June 7, 2003, videotaped interview in Las Vegas, reviewed and corrected by Danny B Burisch, Ph.D. (His family says his middle initial has no period. See birth certificate in More Information below) In this section of the interview, questions were asked by Bill Hamilton and the others. The questions are ALL CAPS without specifying specific questioner, except where specifically noted for Bill Hamilton.